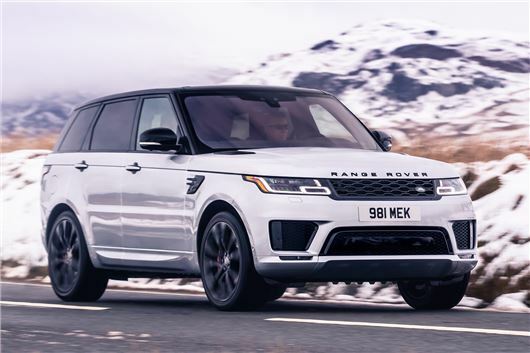 Land Rover has announced a special edition Range Rover Sport with a new six-cylinder petrol engine and a £81,250 price tag. The Range Rover Sport HST will be the first to feature the new 3.0-litre straight-six Ingenium petrol engine, which is claimed to be better balanced and more efficient than the previous V6 petrol. The new engine uses an electric supercharger powered by a 48V mild hybrid system to reduce lag. With 400PS and 550Nm of torque, the Range Rover Sport HST reaches 62mph in 6.2 seconds and on to a top speed of 140mph. An electric motor can harvest energy through regenerative braking and store it in a 48V battery in a bid to improve efficiency. Officially, the Range Rover Sport HST will return 30.5mpg and emit 213g/km CO2. Alongside the new engine, upgrades for the HST include carbonfibre trim on the exterior, along with red brake calipers and a choice of five exterior colours - Santorini Black, Fuji White, Indus Silver, Firenze Red and Carpathian Grey. Inside, 16-way Dynamic front seats are available with an updated colour pattern. Suedecloth detailing is standard on the steering wheel and gear lever, along with satin chrome gear shift paddles. Orders for the new Range Rover Sport HST are open now, with prices starting at £81,250. Well if you believe them that the losses are due to the diesel situation then introducing a modern, powerful gasoline engine can only help. Going petrol or hybrid, yes, but not moving your range (pardon the pun) further up the luxury/complexity price bracket before you fix the many electrical (as well as mechanical) gremlins is NOT a good idea. Fix the basic problems first, then after they are doing ok, then add the new gizmos.